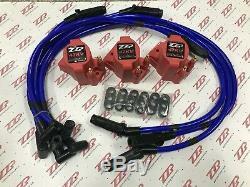 ZZPerformance 3800 High Voltage Coil Packs + 10.5mm Blue Spark Plug Wire Combo. ZZPerformance Ignition Combo Performance kit. ZZPerformance High Voltage Coil Packs Set of 3. ZZPerformance 10.5mm Blue Spark Plug Wires. Also includes a set of 6 Spark plug wire separates custom made for the thicker 10.5mm spark plug wires. Spark plug wires are available in Red and Black also. The Coil Packs are compatible with many different vehicles, but the spark plug wires are only compatible with the FWD 3800 Series II and series III regular and supercharged engines like. All 3.8L engines only. Will not work on some 3.1 and 3.4 engines, but there are variations so we cannot guarantee it. You will have to see if your vehicle uses the D555 coil packs as there are some 3.4 monte carlo's that use a different setup. We only guarantee fitment for the 3800 engines. Does not work for the older series 1 3800 engines. Spark Plug Wires are Not compatible with the RWD 3800 Camaro or Firebirds. Look for ZZPerformance on all social platforms! Today ZZP is located in Wyoming, MI. Occupying over 30,000 sq ft, we are the World's Largest Supplier of aftermarket performance parts for 3800, Sonic/cruze, Ecotec, and soon to be ATS platforms providing industry leading customer service and support. ZZPerformance provides you with highly specific technical information, not found anywhere else. All manufacturers names, symbols, and descriptions, used in our images and text are used solely for identification purposes only. The item "ZZPerformance 3800 High Voltage Coil Packs + 10.5mm Blue Spark Plug Wire Combo" is in sale since Thursday, August 23, 2012. This item is in the category "eBay Motors\Parts & Accessories\Car & Truck Parts\Ignition Systems\Ignition Wires". The seller is "zzperformance_esales" and is located in Grand Rapids, Michigan. This item can be shipped worldwide.